This study assesses the current situation of the domestic airline industry. It brings to fore the market conditions, and establishes the problems faced by the domestic airlines and validates these problems through analysis of traffic data from various sources. 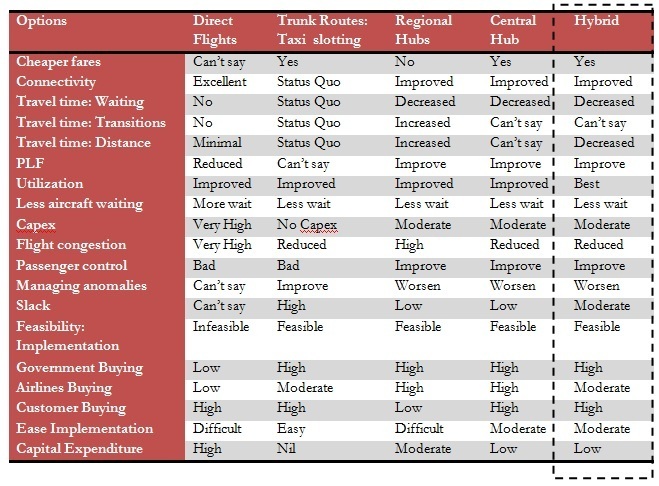 It also evaluates different operating models in terms of running the airlines (point-to-point, hub-&-spoke or a mix of these two systems) and recommends the model that would be most suitable to address the current problems. The Low Cost Carriers and scheduled carriers have to compete head-on for their share of the market. Low Cost Carriers remain the most competitive addition to the Indian airlines industry until date. In 2003, Air Deccan created the segment in India and since then, there has been a spurt of low cost carriers. All of a sudden, the full service airlines realized that the LLCs were blowing a hole in their pockets and they could do absolutely nothing without cutting the frills, which would eventually strip them of their full-service status. The Low Cost Carriers and scheduled carriers have to compete head-on for their share of the market. Private domestic carriers have increased their market share from less than 1 percent in 1991 to over 80 percent in 20081. Currently LLCs control around 45 percent of the domestic market. The government has also permitted some private Indian carriers to start international operations from the country. However, massive losses of over USD 500 million in 2006-07 have plagued the industry despite an upsurge in passenger traffic in recent years. Factors such as high fuel prices, increased labour costs, extremely low fares from some new entrants and rapid fleet expansion have accounted for the losses. Porter�s five forces analysis suggest that, at present the industry does not look attractive to an incumbent as both supplier and buyer side bargaining powers are high. While the threat of new entrants or a substitute is limited, competition inside the industry is high. In addition, fragmentation has shifted the industry away from a consolidated state, as evident from Exhibit 1 below. Most of the airports hit by recession are Tier I and Tier II airports. Tier III and IV airports have shown steady growth even during recession. Chandigarh, Bagdogra, Lucknow, Amritsar and Visakhapatnam have emerged as the major airports of focus with growing demand. A graphical analysis for Goa shows that demand peaks in December - January and is the lowest in July, as shown in Exhibit 2. From the graph, it is evident that while the supply closely matched the passenger demand until 2008, in 2009 the over estimation of demand by the airlines has led to low passenger load factors. Currently the connectivity for TIER I and for most of TIER II airports is direct. The Air Network in India map shows that although most of TIER II and some TIER III airports with close proximity connect with each other directly yet majority of them connect through a TIER I city by connecting flights. The following section envisions different options to overcome this problem and evaluates them using a set of criteria. Brief description: This option involves having direct flights to all destinations, like managed by the Southwest Airlines in the USA. We considered this option looking at the geographical makeup of the country and the flow of traffic between airports. Brief description: This only affects the trunk routes. We propose that the current random airline routes between TIER I cities be replaced by a slot wise allocation where the passenger can buy ticket for 8-16 hour window in a day and can board any flight in that window. Many European countries use this system to make air travel more convenient to the passengers. Brief description: This model would include having a hub and spoke model with five regional hubs in, Delhi for North, Kolkata for East, Mumbai for West, Bangalore for South and Nagpur for central India. All the flights in the respective regions flow to regional hubs, then to the destination regional hub followed by the destination city. If a person has to travel from Trichi to Chandigarh then the route would be as shown in Exhibit 3. Brief description: This model would include having a hub and spoke model with a central hub for all the airlines at Nagpur or Pune. All the flights in the respective regions flow to central hub and then to the destination city. A person travelling from Trichi to Chandigarh would take the route shown in Exhibit 4. We have studied these options depending on how the three major stakeholders in the system (passengers, airlines and airport authorities) view the setup. Exhibit 5 shows the rating of the five options envisioned on each of these parameters. We find that the fifth option comes out as the best within the given constraints. The Government of India and the Civil Aviation Ministry are required to play a mammoth role to bring about a restructuring as radical as this. The Government has to first frame policies, which demarcate trunk routes from normal routes and clearly chalk out the routes for reaching specific airports. It has to lay down rules for airlines to operate in trunk routes or Hub-Spoke routes. The government should auction the slots off to capable airline operators who have experience in flying trunk routes. Linking this auction to bidding for non-trunk routes will lead to cross subsidization of less frequented routes. 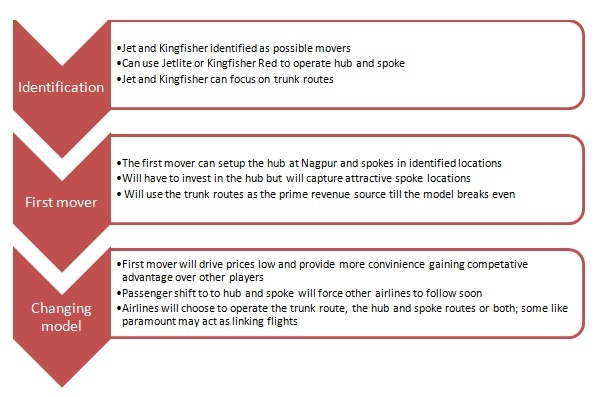 As this plan will make the airlines profitable and reduce the problems faced by them, it makes a lot of financial sense for an airline to champion this plan, set up its own hub and spoke model at a reduced level of 20 cities, and gain the first mover advantage by capturing the most attractive locations. The question is which airlines will be best able to implement such a model. Current coverage and smaller planes that currently shuttle smaller locations: The airline should have a national coverage, covering at least 15 identified cities and should have at least 15 smaller planes that are currently flying across smaller destinations to make the model work. Financial muscle and ability to implement this plan: This plan requires financial investment at the hub airport to have the systems in place to operate optimally. Currently Kingfisher, with the liquor business behind it, and Jet airways are the only airlines that qualify on this parameter. Ability to influence the government: The airlines should have significant lobbying power to get the required infrastructure at airports, especially the hub airport. Again, Jet and Kingfisher pass this litmus test. Ability to operate the trunk as well as hub and spoke: The airline should have the ability to operate both the routes, as the hub and spoke model will take time to break even due to capital investments. The trunk routes will provide financial cushion to the airlines. Kingfisher and Jet are the only airlines that have this capability. Based on our analysis we can see that Jet and Kingfisher are the airlines that have the capability to execute this plan and who ever moves first, forces the other to respond soon and also cuts him off from attractive destinations. Exhibit 6 shows the summary of the plan. Most of the problems facing the Indian aviation sector are problems of its own making. Many of the larger players have started operating on every possible route irrespective of the possible load factor reduction. This has dealt a serious blow to their efficiencies. In addition, almost every airport in the country connects through one of the six busiest airports and any further expansion of aviation infrastructure under the existing route structure will cause even further congestion at these six airports. With the emergence of business hubs in Tier II cities like Pune, Lucknow, Indore and Chandigarh, the requirement of air travel along these routes has increased manifold, however, the infrastructure does not exist for it as India continues to nurture a �metro-only� aviation industry. The model proposed in the study could provide a possible solution to the problems mentioned above; however, it will have to face its fair share of public criticism and will require pro-active handling by the government. The only other way it can be brought to pass is, if the private airlines realize its value in cutting their losses and make use of the proposed model to streamline their systems.